Next month, gourmet dairy brand The Collective will be the first FMCG business to introduce a novel near-infrared (NIR) colourant technology developed by masterbatch and additive specialist Colour Tone, to ensure its iconic black plastic yogurt pot lids can be effectively recycled. Like most black plastics the original Collective lid featured carbon black and other pigments which absorb the infrared signal used to sort plastics packaging, which made it ‘invisible’ to the sensors used by recycling operations. 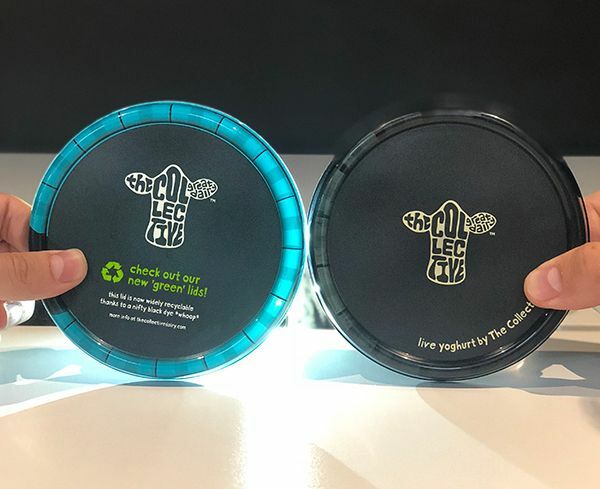 This meant The Collective’s black yogurt pot lids would end up as residual waste destined for landfill or incineration, while its clear polypropylene tubs are recycled. The brand responded to this challenge by tasking its sustainability team to find a more eco-conscious design solution for its distinctive packaging. The Collective and Nextek chose to partner with additive and masterbatch specialist Colour Tone to develop a new black masterbatch, as it offered technically proven NIR colourant technology together with excellent colour and performance capabilities. Colour Tone was the only supplier able to satisfy all its subsequent trials to ensure the technology’s readiness for market. The WRAP funded trials addressed the following issues: – the masking strength of the NIR pigment itself; the development of end markets for recycled detectable black plastics and an in-market trial to prove the recycling process for black ready meal tubs and trays. Tony Gaukroger, director, Colour Tone Masterbatch, comments: “We are delighted to support The Collective with this market first for the FMCG industry. It has adopted a revolutionary colourant technology that enables the effective detection and sorting of black plastic waste for recycling into high quality materials. This helps support our growing circular economy and the brand’s sustainable business objectives. From October 2018 the black lids on The Collective’s 450g and 900g yogurt tubs will feature the new NIR reflecting colourant to help ensure that the consumer’s recycling efforts do not go to waste. If you want to find out if your plastic packaging is NIR sortable there is a simple test you can do using a TV controller, visit @ColourToneWorld to find out more.